this last tool on the mini-productivity list is admittedly a bit weird, but bear with me because i think it has merit to it. 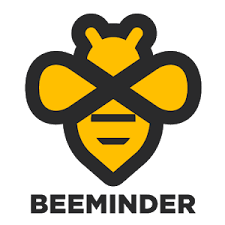 it’s called beeminder, and the tagline is “reminders with a sting“. so, here’s how it works: you set up a quantifiable goal, and commit yourself to reaching it within a certain amount of time. beeminder plots a nice graphic that shows you the yellow brick road, ie, is the path within which you must stay in, in order to reach that goal. the goals can be anything: read or write a certain amount, go to the gym, reach a certain weight, etc. and there are a number of integrations that import data automatically. what happens when you don’t stay on the yellow road? that’s where it gets interesting. for every day over the line, beeminder will charge you — the amount is configurable, but increases over time. you don’t have to put in a credit card to give it a try, but it really helps make the threat credible. oh! and you can pause or delete your goals, but any changes you make will only take effect a week from now, to prevent any sneaky weaseling. 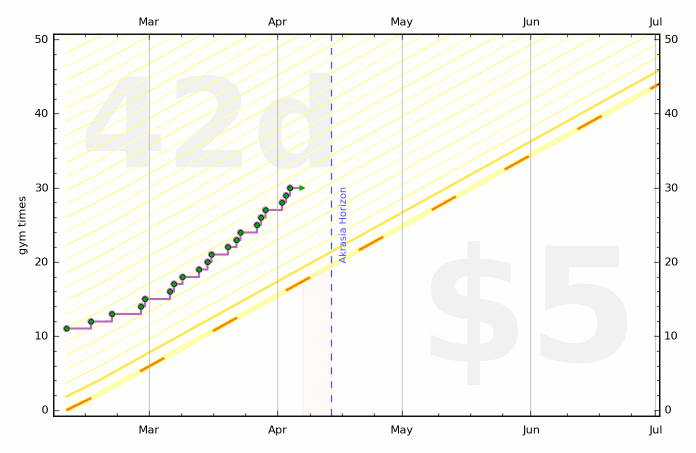 i’m well above the threshold and could stay flat for another 42 days until i was charged $5. i’m not planning to de-rail on it, but i like the looming threat on the horizon, combined with the graphic representation of each goal. it’s a neat way to follow your progress and keep yourself in check. ps – do you use any other tools that i should check out?